Creating an outdoor room with awnings, pergolas or loggias offer an excellent place to enjoy a meal, play with the kids, or just relax. Not to mention adding usable square footage to any style of home. Available in a variety of colors and styles, awnings are an amazing addition to any home. Never before has shade been so BEAUTIFUL or smart. A shade structure made using our unique fabric offers more than just extended space. Awnings also protect from the sun’s harmful rays and lowers your energy bills. Shade is a smart choice for anyone, and awnings are the ideal way to add low-cost shade to your porch or room. Shade, now available in hundreds of GORGEOUS styles. Once you have chosen the right shade structure for your home, the next step is finding the perfect fabric. 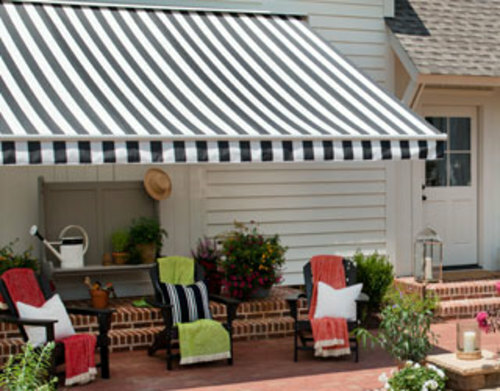 Awnings and umbrellas can be a way to add a burst of color to your space. 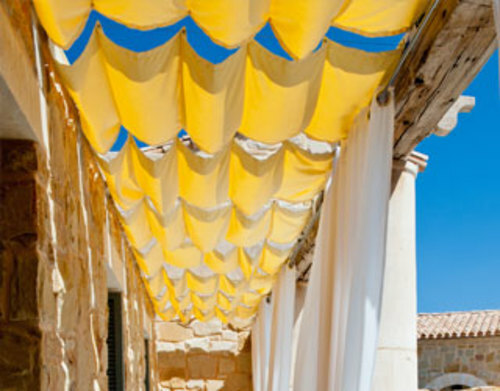 Or if you are looking for your awnings to blend in, match the fabric color with your home. Also keep in mind your furniture’s color palette – both inside and out. Your shade structure will be visible from inside the home, so be sure your fabric choice looks just as lovely from inside. Our large selection of awning fabrics and styles ensures your awnings will match the style of your home. Fixed or retractable, awnings are the PERFECT choice. 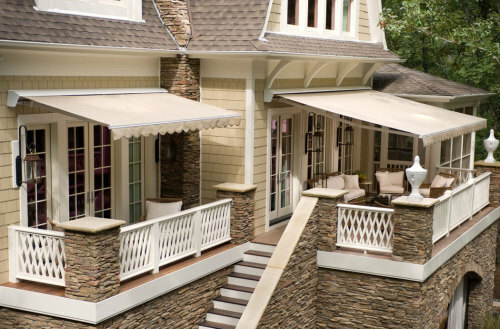 If the area you wish to shade is close to the house, awnings may be the right choice for your home. Retractable awnings provide the flexibility to relax in the shade when extended or bask in the sun when retracted. For more permanent shade, fixed-frame awnings will keep your outdoor space constantly covered from the elements. Awnings are the perfect choice for the homeowner who wants to add additional space at low cost. The temperature difference with awnings or other shade providing structures is immense. Awnings are an amazing and value adding addition to your home.